Preheat oven to 400*F. Peel and chop the squash. Reserving the seeds. Place in a single layer on a silicon-lined baking sheet. Spray with a little coconut oil, sprinkle with salt and pepper. Bake for about 40 minutes or until fork-tender. While squash is baking. Cook ½ cup of rice with 1 cup of water. In a jar, add the olive oil, vinegar, clementine juice and zest, mustard, shallot, and salt and pepper. Shake well until combined. 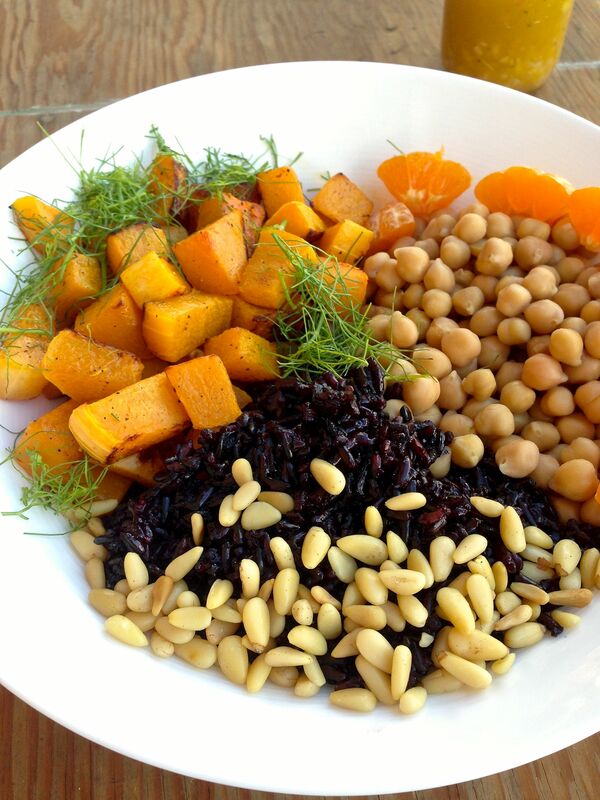 Mix the cooked squash, rice, chickpeas, pine nuts, clementines and fennel, with the dressing. Tip: start with just ⅓ to ½ of the dressing. Depending on your tastes, you won't need it all. Optional topping: roast the reserved butternut squash seeds. Click here for instructions. The seeds did not make the photo, but added a welcomed crunch. Serve slightly warm and enjoy! Thanks again to Melissa’s for the beautiful veggies. I also enjoyed the potatoes smashed in a recipe from Pioneer Woman, and used fresh pearl onions with some good French wine in a Coq Au Vin. I’m saving black eyed peas for my Hoppin’ John. You can see all the recipes my fellow bloggers came up with below. Please pin to save the recipes! Thank you. This entry was posted in Food, Healthy Recipes, Recipes for the Whole Family, Seasonal Recipes and tagged easy farm to table, easy seasonal cooking, easy seasonal recipes, farm to table, gluten free, naturally gluten free, vegan, vegetarian. Bookmark the permalink. I love Black Rice – and I just read today a list of the best stuff to eat to stay healthy and black rice was one on the list! Good timing! Thanks for sharing the recipe! Hi Megan, I didn’t know it was so healthy. That is good to know! Love the vinaigrette!!! And black rice is something that I keep forgetting I have in the pantry. Wonderful recipe using the challenge box! Thanks Kim! The vinaigrette was yummy. I have used something similar on Brussels sprouts, too. yum! 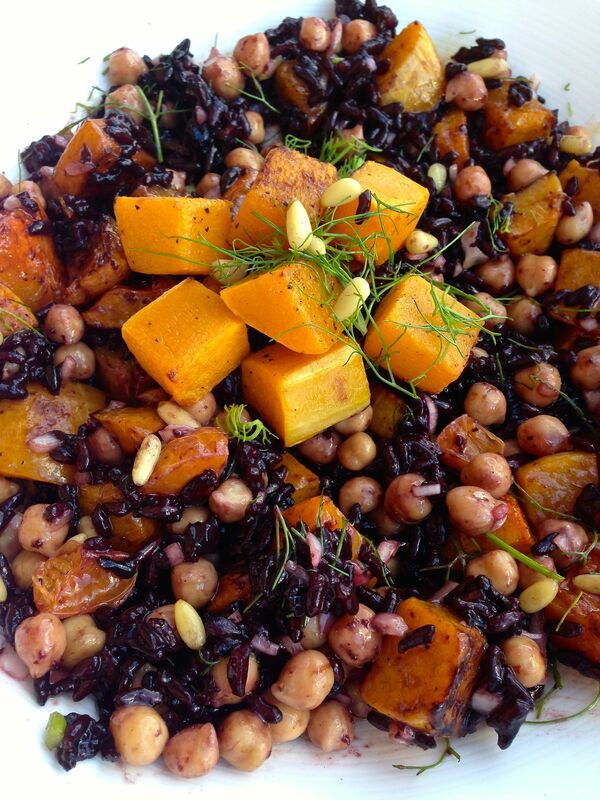 i could seriously live on butternut squash – this looks DELICIOUS! Thanks Kate! I love butternut, too. Got one in my kitchen now.